Battery Replace Whitechurch - Car Battery Flat? - Get a Quote! AllVech offers a complete battery replacement service in Whitechurch, Dublin on all vehicle types. You’ll never be stuck if your battery dies while on the move. Call AllVech and we’ll come and replace your battery on the go in Whitechurch! If you just need a jump start, we’ll come to you and get you moving straight away. 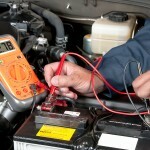 A healthy, top-functioning battery is key to the running of your vehicle. It’s what kick-starts the starter motor and runs all of your vehicle’s electrics when your engine is switched on. With such a heavy-duty function, sometimes your battery will need repairs. In fact, every 4 – 6 years, batteries need to be replaced. Are You Stranded in Whitechurch? For the quickest response in an emergency with your Battery in Whitechurch, please call 087 310 1393. We will have a mobile mechanic dispatched within 15min. Book your battery fitting at a time in Whitechurch that works for you. We can come to your home, place of work and of course the roadside for assistance. In today’s hectic world, it’s hard to make time for everything. AllVech makes your life easier by coming to you for all Battery services. We strive to give you the best possible Battery service at excellent rates. Thank god for Shane from Allvech. He came out to my home in Whitechurch with and fitter my car with a battery after it had gone dead. He was in and out in a flash and kindly disposed of the old battery. Highly recommend!